Home Renewables News Blogs & Opinion Are building-integrated photovoltaics (BIPV) the answer to sustainability? Buildings capable of generating their own power for heating and cooling purposes belonged to the realm of science fiction not so very long ago. Now they’re becoming increasingly prevalent, with tech giants like Apple paving the way for their widespread adoption. In many ways it’s no surprise because according to industry research, heating buildings is one of the biggest challenges in the drive to provide affordable yet secure low carbon energy on a grand scale. The electricity used to control building temperatures accounts for nearly half of our energy consumption globally and around a third of our total carbon emissions. Government directives the world over are striving for nearly zero-energy buildings (nZEB) by the end of next year, and for net zero carbon buildings by 2030, meaning they will have to be 100% sustainable as far asheating, hot water, ventilation and cooling requirements are concerned. The race is therefore well and truly on to find new ways to harvest nature’s free energy. For such ambitious carbon-neutral goals to be achieved, building architects and construction engineers need to devise ways of transforming buildings from being net “users” of electricity to net “producers” and to do this they will need to start exploiting building structures as a whole. Thus far, the energy generated by large buildings has been heavily dependent on solar panels strategically mounted on building rooftops. The concern, however, is whether this limited space is large enough to support enough panels to meet the total energy demands of those buildings. Solar panels currently account for ¾ of all deployed photovoltaic systems. In densely populated cities like London, Hong Kong, Dubai, Beijing or Kuala Lumpur, the cost of land per square metre is at a premium, so building structures are expanding upwards, not outwards to make best use of the available space. The usable area where solar panels can be installed is therefore extremely limited. Building facades, on the other hand, are expanding in size, but their contribution to a building’s total energy requirement is minimal because photovoltaic technology has not been integrated into construction materials such as glass, metal or tiles on an industrial scale. Not only do these materials offer the potential to contribute significantly to a building’s total energy yield, by incorporating BIPV capabilities into their makeup, but these base materials can also contribute to the insulation of that building (therefore making it more energy efficient) and help reduce noise pollution. 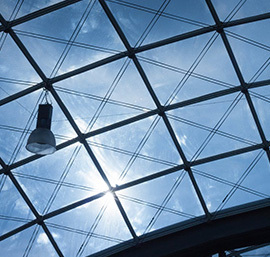 A construction material that lends itself particularly well to BIPV technology is glass. Even in its basic form it can effectively heat a building as a result of the greenhouse effect. BIPV offers the potential to outweigh the importance of solar panels in the carbon neutral building revolution even though they currently cost more than conventional solar panels. Most cost calculations simply have to take into account the mark-up on a conventional facade when a new envelope is being built. Such calculations have demonstrated that the ROI on glass PIBV facades can be achieved within ten years. However, as the widespread deployment of BIPV materials gains momentum, so too do the challenges of keeping said materials clean because BIPV panels cannot perform optimally unless they’re able to maximise the amount of energy absorbed in the first place. The amount and frequency of cleaning needed will depend on where that building is situated and its overall size. The taller the building, the more difficult and expensive it is to clean, requiring specialist equipment such as cleaning robots and colossal amounts of water. The amount of electricity needed to power such equipment could potentially outweigh the benefits and/or adoption of renewable energy in the first place. The only way the construction industry is ever going to achieve the desired zero carbon utopia is if it transforms all buildings into mini power stations, but to do this you need to eliminate, or at the very least massively reduce extensive cleaning requirements. So far this has proved to be both technically challenging and not viable economically. There could be a solution on the horizon though thanks to pioneering R&D being carried out by a consortium of companies, including industrial coatings specialists Opus Materials Technologies. The company has secured over £4m in UK and EU funding to date and is working with academics, researchers and scientists to develop Solar Sharcâ , an easy clean, hydrophobic durable transparent coating based on cutting edge nanotechnology. This coating can be easily applied to the glass substrate as part of the manufacturing process of BIPV or as a retrofit application to existing BIPV installations. Field trials carried out to date have delivered promising results and if the technology were to go mainstream, the high maintenance costs associated with the renewable energy could be eradicated, changing the face of energy production for ever by enabling buildings to be self-sufficient in their energy requirements and active contributors to the global grid system.